This Central American country has an interesting history story to tell. Back in the day, the United Provinces of Central America was created to unify all but one of the 6 former provinces of Spanish Guatemala, that declared independence back in 1821. 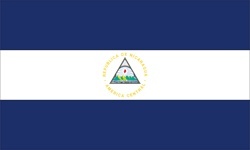 Its flag was like that of Nicaragua, and the official form had the arms in the center, like those of Nicaragua. They consisted of a triangle with five volcanoes, which represented the five states, a rainbow (represented peace) and a cap of Liberty. Around these elements was a gold band that displayed the following title: "Provincias Unidas del Centro de America." The confederation lasted till only 1839. The country then reverted to these flags and arms in 1908, although they were revised slightly by new regulation that were introduced in the year .1971. Colonial Flag sells Nicaraguan flags to be hoisted on flag poles and such, on this website.